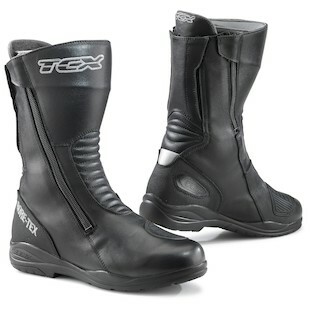 TCX has long been known as a leader in the moto boot segment, because they offer high quality, well thought out, and protective first and foremost. Starting with these principles, they then build a variety of styles to suit your needs. For their Fall 2015 release, TCX has added a new product to their lineup, and brought in a much needed update to a perennial favorite. It has long been said that imitation is the sincerest form of flattery, and with the brand new TCX X-Tour EVO Gore-Tex Boots, TCX is coming after Daytona premium touring boots. These CE-Rated boots are the flagship product from TCX, and introduce D3O armor to the boot world, replacing the usual TPU armor. The main benefit here is comfort, as D3O is a molecular armor that can stay soft and flexible during everyday use, and only hardens upon impact. The entry system is another first for TCX, as they are now using zippers on both sides of the boot, and a pivoting front. This allows for a super wide opening, and secure fit, and even some adjustability. Last but not least, the X-Tour EVO GTX Boots are tied together with full grain leather and a Gore-Tex membrane with an insulated liner for all-weather, year-round comfort. At a price significantly less than the competition, these boots are a great value, and we can’t wait to get our hands on them! Also new for Fall 2015 are the TCX S-Sportour EVO Air Boots. 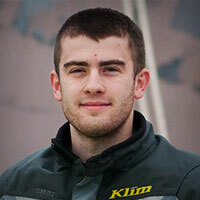 This is a much needed update to the S-Sportour EVO boots that have been a strong seller since they were launched. The main difference here is - you guessed it! - a perforated microfiber upper construction for a huge increase in airflow. Microfiber is great in this case because it allows TCX to make sure the material is consistent across the entire boot, and it is lighter than leather. Backing up the microfiber outer construction is a new breathable inner lining to better wick the sweat from your feet. 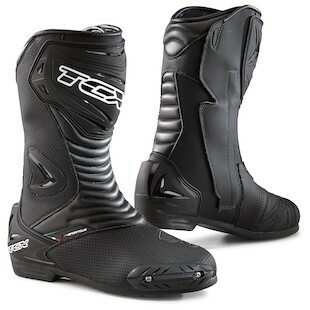 Whether you are an aggressive street rider, or a track junkie on a budget, these TCX S-Sportour EVO Air Boots are now a great hot weather option at a reasonable price point. Evolution over revolution is definitely the theme with TCX this fall, but that is to be expected from the brand that invented the CE-Rated Moto boot in the first place, and has been refining it ever since. The new X-Tour EVO Gore-Tex Boots are a fresh reinterpretation of what the competition is doing, and the D3O armor is something we hope will trickle down through the rest of the lineup. The hot weather version of the TCX S-Sportour EVO Boots on the other hand is a welcome budget sport riding boot that offers better quality and less cost than the competition.